Sarah Nader- snader@shawmedia.com Adrian Pavlik, 6, of Wonder Lake plays in the water at the Acorn Alley Splash Pad at Veteran Acres Park Thursday, June 12, 2014. 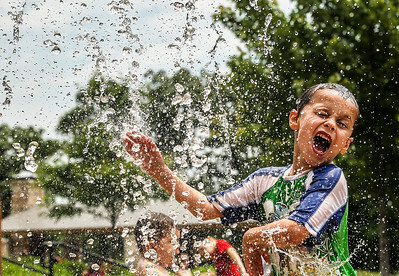 The splash pad is open Memorial Day through Labor Day from 9 a.m to 7 p.m.
Adrian Pavlik, 6, of Wonder Lake plays in the water at the Acorn Alley Splash Pad at Veteran Acres Park Thursday, June 12, 2014. The splash pad is open Memorial Day through Labor Day from 9 a.m to 7 p.m.